Today, I owe very much to the days of IB English, not least for allowing me to recognize the tremendous truths that can be found in the art of writing and story-telling. I had been reading Isabel Allende’s The House of the Spirits when I suddenly found myself wanting more, to learn in-depth about the history surrounding the violent chain of events leading up to and beyond the Chilean coup d’état of 1973. It was then that I discovered how influential an author can be in voicing his/her experiences and views to a wider audience; and it was also then that I first had the opportunity to read Darwish’s Memory for Forgetfulness. 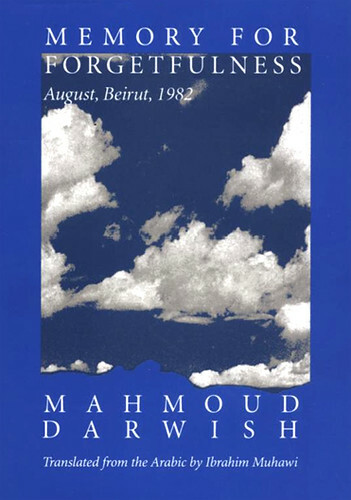 Taking place in Beirut in the summer of 1982, Mahmoud Darwish, a Palestinian writer and poet, poignantly tells the story of his experience during the second Israeli military invasion of Lebanon and siege of Beirut in the 1980s. Switching back and forth between dream and reality, poetry and prose, past and present, Darwish relays the emptiness, the pain, and the internal struggle encountered under such extreme and dangerous conditions. This book not only captures a time that is far from forgotten in the history of Lebanon, but it also allows the reader to come close to truly understanding how it feels to be experiencing what is going on in Lebanon today. Now, more than ever, Memory for Forgetfulness bears unparalleled relevance and insight into the conflict that is raging across the Middle East. The sky sinks like a sagging concrete roof. The sea approaches, changing into dry land. Sky and sea are one substance, making it hard to breathe. I switch on the radio. Nothing. Time has frozen. It sits on me, choking me. The jets pass between my fingers. They pierce my lungs. How can I reach the aroma of coffee? Am I to shrivel up and die without the aroma of coffee? I don’t want. I don’t want. Where’s my will? It stopped there, on the other side of the street, the day we raised the call against the legend advancing on us from the south. The day human flesh clenched the muscles of its spirit and cried, “They shall not pass, and we will not leave!” Flesh engaged against metal: it won against the difficult arithemtic, and the conquerors were halted by the walls. There will be time to bury the dead. There will be time for weaponry. And there will be time to pass the time as we please, that this heroism may go on. Because now we are the masters of time. Bread sprang from the soil and water gushed from the rocks. Their rockets dug wells for us, and the language of their killing tempted us to sing, “We will not leave!” We saw our faces on foreign screens boiling with great promise and breaking through the siege with unwavering victory signs. From now on we have nothing to lose, so long as Beirut is here and we’re here in Beirut as names for a different homeland, where meanings will find their words again in the midst of this sea and on the edge of this desert. For here, where we are, is the tent for wandering meanings and words gone astray and the orphaned light, scattered and banished from the center. Identically monotonous voices. Sand describing sea. Eloquent voices beyond reproach, describing death as they would the weather, and not as they would a horse or motorcycle race. What am I searching for? I open the door several times, but find no newspaper. Why am I looking for the paper when buildings are falling in all directions? Is that not writing enough? Memory for Forgetfulness is available online in full, courtesy of the eScholarship Editions project.